Customers have a strong interest in the scalability of data warehousing solutions on the IBM System z platform using DB2 for z/OS. 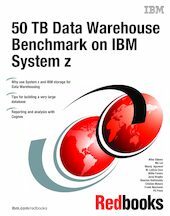 Because BI environments continue to grow, this IBM Redbooks publication explores the scaling and management of data in sizes beyond 50 TB. We explore the architectural software components that enable us to manage a data warehouse of this magnitude, including the Cognos product set. The objective of our 50 TB study was to test System z scalability in a BI environment and to develop the best practices of managing large data warehouses. The IBM System z was proven to scale to larger volumes, manage a mixed workload, lower the cost of a BI solution using zIIPs, and increase performance by using hardware compression.